Originally from Nigeria, Nnamdi Moweta came to the US over twenty years ago. After studying at the San Francisco Art Institute, he quickly established himself as an influential DJ, music supervisor, consultant, manager, and promoter. 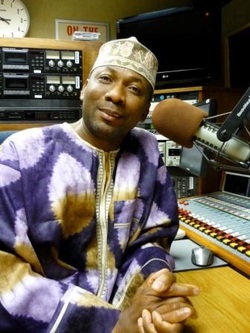 He is committed to showcasing the best of African and African-influenced music and currently hosts the long-running radio show Radio Afrodicia, which features a large variety of contemporary musicians. From Fela Kuti to Nneka, Nnamdi has interviewed renowned international artists past and present. Always on the forefront of the African music scene, Nnamdi continues to promote and support local endeavors that strive to educate the public about African culture and music. Nnamdi has always had his hand on the pulse of African music; he managed Chief Stephen Osita Osadebe, Nigerian performer known for reinventing highlife music, and Nnamdi lent his talents to the 2009 film, 40, as the music supervisor. In 1982, before turning his sights to music supervision, Nnamdi scored as a boxing manager. Later he combined his passions and in 2008 worked as the music supervisor for the winner of eight international film festival awards, Kassim the Dream. The compelling documentary is about Kassim Ouma, Ugandan child soldier turned World Boxing Champion. More recently, in 2011, Nnamdi interviewed boxing great Samuel Peter, and trainer Freddie Roach along with others for Africa Channel's sports documentary, Boxing Before the Bell. With a strong following, Radio Afrodicia is one of the few Los Angeles-based radio shows that has made an indelible mark on the face of African music.